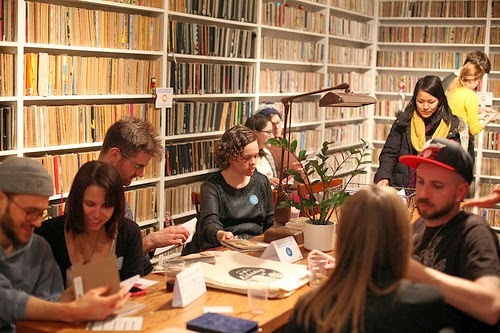 On Friday I received pictures from the Brooklyn Opening from the lovely people at the Sketchbook Project. I spent a fun half an hour poring over the photos trying to spot my sketchbook. No luck. That didn't stop me from imagining that someone pictured was viewing my work. Some people seemed too serious, or too confused. Some looked bored. Some weren't looking at sketchbooks at all. (That's right. I'm talking about you Mr. Texty. Put down that phone and give your full attention to that book! Someone worked hard on it!) After scanning the possibilities a few times, I've decided to imagine that the couple in the lower left corner of this photo are viewing my sketchbook. Don't they look like they're having fun? That was my goal as I worked on my sketchbook. I wanted my reader to have fun. I wanted to make them smile. When I imagine that couple looking at my sketchbook I feel that my mission has been accomplished. If you'd like to be a real reader of my sketchbook, and if you're in Asheville, North Carolina on Wednesday, March 26 between 1 and 5 pm, stop by The Asheville Bookworks. The mobile library, including my sketchbook, will be parked outside the the doors waiting to make you smile. This sounds like such an interesting project - obviously that couple in the photo think so, too! Interesting, terrifying, fun. Choose your adjective. I'm glad participated. I think the sketchbooks for the 2015 tour are available...hint, hint. Might be worth looking into Val the Creative. Thanks foe stopping by. I'm so happy I know you! You're brave and smart and talented and freaking photogenic! Good for you, and I'm absolutely sure your sketchbook rocked several worlds!